For those unfamiliar with the Rosary, there are four sets of mysteries: The Joyful, The Luminous, the Sorrowful, and the Glorious. The Joyful Mysteries are The Annunciation, The Visitation, The Birth of Jesus, The Presentation in the Temple, and The Finding of the Child Jesus in the Temple. The Luminous Mysteries are The Baptism of Jesus, The Wedding Feast at Cana, The Proclamation of the Kingdom, The Transfiguration, and The Institution of the Eucharist. The Sorrowful Mysteries include The Agony in the Garden, The Scourging at the Pillar, The Crowning with Thorns, The Carrying of the Cross, and The Crucifixion. Lastly, the Glorious Mysteries rejoice with The Resurrection, The Ascension into Heaven, The Descent of the Holy Spirit, The Assumption of Mary into Heaven, and the Crowning of Mary as Queen of Heaven. Phalen does offer an appendix with instructions on how to say the Rosary. Phalen emphasizes that the Rosary is a very scriptural prayer, with both the prayers themselves and the mysteries rooted in scripture. 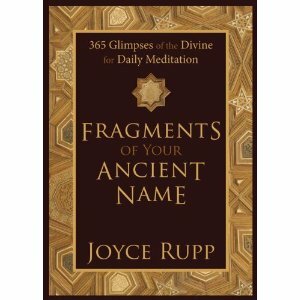 He opens the meditation on each mystery with the relevant scripture passages. He then offers a more personal reflection, frequently integrating anecdotes and lessons learned through his own priestly ministry. From there he generalizes to experiences we all may have had at some time in our lives. Questions, appropriate for either personal reflection or group discussion, close out each chapter. His reflections offer a new perspective on the mysteries of the Rosary and their continued significance. While much can be gained simply by meditating on Jesus’ life as revealed in Scripture, connecting it to modern-day experiences may help some feel more connected to the events of so long ago. For example, we are unlikely to ever experience being scourged with a whip, yet many have experienced the pain of bullying or abuse. An angel might not appear to us, but we all have annunciation moments that call us to a new way of life or new circumstances. People rarely literally come back from the dead, but there are all sorts of resurrections into a new life – those who have recovered from an addiction, survived cancer, or been released from prison all experience a resurrection. Like Jesus in the garden, we have all had the experience of begging God to take away a particularly heavy set of circumstances and asking for the courage to accept them. We have had the pain of carrying our crosses. The mysteries of the Rosary are intimately connected to our lives, in ways we may never have previously considered. 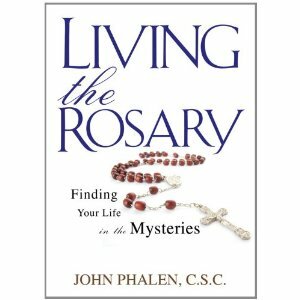 “Living the Rosary” will invite you into a deeper relationship with this powerful form of prayer. Perhaps somewhere out there are women who can completely empty their minds and focus totally on God. I’m sorry to say that I am not one of them – never have been. Just by way of example, there are times I have said an entire rosary and realized at the end of it that my mind was elsewhere the entire time. Perhaps someday my life will have less stress and less to think about, but I’m not holding my breath. Most of the senior citizens I know still have a whole lot on their respective plates – life seems to get more difficult, not less, with age. Therefore, I’m fairly certain distraction during prayer is something I will be dealing with every day of my life. Obviously, it would be better if I could clear my thoughts, but that doesn’t seem to be within my capabilities at the moment. Then, what should I do? Does my prayer not count because my mind wanders? Should I give up praying as a lost cause? No, not at all. Praying is too important to abandon due to distractions. 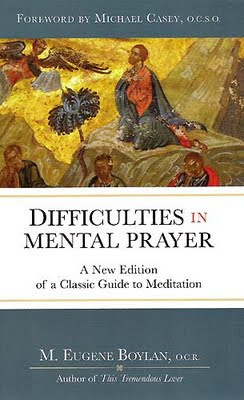 When I realize that my mind has wandered, I try to bring it back to prayer. If my mind has drifted to a concern I am having, I ask God to help me with it. If my mind has traveled to a sinful thought, I ask God’s forgiveness. I may not focus on every word of prayer that I say, but I do know that God knows my intent to lift up my heart and my needs to Him. This isn’t to say that I am giving up the effort to try to focus more. Lately, I have been making a concerted attempt to say one “Our Father” each night before I go to bed and truly pay attention to each word and the meaning it contains. It isn’t easy, and I don’t always make it through the whole prayer, but I am trying. In the meantime, I will continue praying and offering my distractions up to God. Why is St. Anthony’s Help Sought in Finding Lost Things? Have you ever prayed to St. Anthony to help you find a lost item? This is a practice I learned from my mother when I was a little girl. Whenever something was missing, she encouraged me to seek his intercession. Over the years, St. Anthony has helped me find many, many things. He hears from me on a nearly daily basis, not only to help me find things I’ve misplaced, but the toys, books, and mittens that my children have lost somewhere in the house and must be found and found quickly. He always helps me. If the item is there to be found, I usually find it pretty quickly, sometimes in some very unexpected places. How did this tradition start? First, let us learn some basics about the life of St. Anthony. He was born in 1195 in Lisbon and given the name of Fernando. 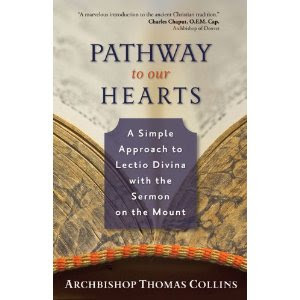 At the age of 15 he entered the religious order of St. Augustine. He would then spend nine years studying Augustinian theology. The life of the young priest took a radical turn when the bodies of the first five Franciscan martyrs were returned from Morocco and carried in solemn procession to his monastery. He was so moved by the experience, Fernando decided that he wanted to be a Franciscan, go to Morocco and become a martyr himself. As a Franciscan, he took the name Anthony. Despite his desire, he never made it to Morocco. He became sick and needed to return home. His ship ran into storms and high winds and was blown to the east coast of Sicily, where he was cared for by the friars in Messina. Anthony might have lived a quiet life as an unknown friar if he hadn’t gone to an ordination of Dominicans and Franciscans in 1222. While he was there, Anthony was asked to give a “simple” sermon. When Anthony began to speak, his holiness and knowledge impressed everyone. St. Francis heard of Anthony’s previously hidden gifts, and assigned Anthony to preach in northern Italy. Eventually, he was asked to also teach other friars. In Padua, Anthony preached his last and most famous Lenten sermons. As many as 30,000 people would crowd to hear him. He would sometimes hear confessions all day. He was exhausted and knew that he would die soon. He died in 1231 at age 36. The following year, his friend, Pope Gregory IX, moved by the many miracles that occurred at Anthony’s tomb, declared him a saint. How did St. Anthony, most known for his skill at preaching, become associated with finding lost things? When he was teaching friars, Anthony had a book of psalms that was very important to him. This was before the advent of the printing press, so the book itself was extremely valuable, but more importantly, it also had his notes for teaching which were irreplaceable. A disgruntled novice decided to leave the community and took Anthony’s psalter with him! Upon realizing it was missing, Anthony prayed it would be found or returned to him. The novice saw a vision which compelled him to return the psalter to Anthony and return to the Order which accepted him back. The stolen book is said to be preserved in the Franciscan friary in Bologna. Shortly after his death people began asking St. Anthony’s help to find or recover lost and stolen articles. You are the patron of the poor and the helper of all who seek lost articles. Help me to find the object I have lost so that I will be able to make better use of the time I will gain for God’s greater honor and glory. Grant your gracious aid to all people who seek what they have lost – especially those who seek to regain God’s grace. Does God Actually Have a Plan for Our Lives? When my time in this world is over, I hope that I have the opportunity to ask God one question. Actually, I would like to ask many more than one, but if could ask only one it would be: Was there a plan for my life? A good friend and I debate this frequently. I argue that God does, in fact, have a plan for each one of us, determined before we ever take our first breath. If we tune in (also known as prayer), we can tap into that plan and do what we were sent to this planet to accomplish. My friend is of the opinion that we are put on this earth and then it is up to us to use our free will to live our lives. What happens to us is a result of those decisions. We are in charge of our destiny. I understand the opposing view point. After all, we do have free will (although I’ve never really understood the balance between our free will and God’s omniscience – that’s another question for the Almighty). We don’t want to be mere pawns in a supernatural chess game. In addition, saying that God has a plan can be seen as a cop-out or an opiate intended to bring comfort, especially in the face of great pain and tragedy in life. People grieving do not want to be told it is God’s will. How can such extreme suffering be part of God’s plan? What kind of a loving God is that? In fact, the whole of Scripture is the story of God’s plan for our salvation. All works for the good. God may not wish the sins and tragedies to happen, but He allows them to occur, and He is able to use them to achieve His purposes. God will not be thwarted. A secondary reason that I believe God has a plan for each of us is that I have seen it in my own life. God’s plan is often only seen in retrospect, and I fully admit that I don’t understand all the various twists and turns my life has taken and continues to take. I’m pretty sure I got off the appointed path a few times. If God had a Plan A for my life, I think I’m now on Plan C or D.
But, even with all that, I can look back over my life and see God’s guidance at work. God hasn’t abandoned me, even when I sometimes feel as if He has. I’ve had second and third and fourth chances. The challenges in my life have each taught me lessons that have served me well as I have moved forward. There have also been times I have been given glimpses of the future. People have made remarks to me, or I have dreamed dreams, that have been totally unexpected or out of context at the moment, yet years later, came to fruition. I think that has been one of the ways God has prepared me for the paths my life would take. A last reason I am convinced that God has a plan for us is that so many things happen that are beyond our control. We tend to suffer from the illusion that we are in charge of our lives. Yes, we do get to make decisions, but life often throws us curveballs. The only decision we get to make is how we respond to them. Those “change in plans” often lead our lives in entirely new directions. Does God actually have a plan for us? My answer is an unequivocal “yes.” I still hope, though, that God will explain it all to me someday. I’d like to know how it was all supposed to work out, where I made mistakes, where I made the right decisions, and the purpose of the hard times. I pray that one day I will understand.